Insect mycologist Richard Humber slowly lifts the thick lid off the top of a round liquid-nitrogen tank used for super-cold storage. Once the fog that forms when the tank's air mixes with that of the humid laboratory clears, he gazes down at the tops of the elongated plastic tubes he keeps inside. He smiles. "These are a bunch of little jewels," he says. "We hold them very dear." The jewels Humber speaks of aren't gemstones. They're specimens of fungi that have potential to protect plants from insects, arthropods, and nematodes. "The emphasis here," he says, "is on acquiring and distributing strains for use as possible biological control agents." 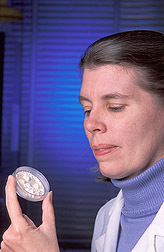 Humber is curator of the ARS Collection of Entomopathogenic Fungal Cultures (ARSEF). It is the world's largest and most taxonomically diverse germplasm repository for fungi that attack insects, mites, spiders, nematodes, and other invertebrates. It comprises nearly 6,500 isolates from more than 425 fungal species from every continent. And that's not counting several hundred stored samples not yet officially added to the collection. "This is a truly unique resource," he says. (K10255-1) ARSEF, which is on Cornell University's campus at Ithaca, New York, helps ARS' Plant Protection Research Unit fulfill its mission: To develop innovative methods to protect crops from pest damage. "We have fungi from 1,400 different locations, from 1,000 different hosts," says Humber. "This represents an extremely high proportion of all fungal species known to affect insects." Over the past decade, ARSEF has emerged as a major resource in the search for fungal compounds to help replace pesticides, many of which have been phased out because of environmental concerns. Humber became the collection's curator in 1976, when it was part of the ARS Plant, Soil, and Water Laboratory at the University of Maine at Orono. At the time, it held fewer than 100 cultures. 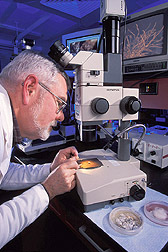 He oversaw its moving twice—first to Cornell to be a housed within the renowned Boyce Thompson Institute's Insect Pathology Program, and again in 1985, when it went across the street to the ARS Plant, Soil, and Nutrition Laboratory's building, where facilities had been remodeled to accommodate it. 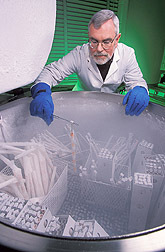 Most of the specimens are kept inside three liquid-nitrogen tanks. The shiny metal cylinders—3 feet in diameter, 4 feet tall—represent the latest technology for storing fungi cryogenically. Inside each tank, grids of more than 1,500 aluminum canes, each a foot long, stand vertically. They are completely immersed in liquid nitrogen that chills them to –196° C. Each cane holds up to six vials, which are guarded against the formation of lethal ice crystals by a special solution. ARSEF is a complex facility equipped to examine and isolate specimens and to identify and distribute them. Shipping, receiving, and cataloging—in addition to research—are part of a day's work as the staff makes the collection widely available to scientific, agricultural, and business communities. "We strive to provide users with pure and accurately identified fungal cultures," says Humber. "In addition, we have always made identification services for specimens and cultures available free of charge to laboratories requesting them." The collection is managed with a customized computer program that tracks the names and origins of fungi, host information, distribution requests, and shipping documents. "It represents a giant leap from the card-catalog system we used to use," says Humber. ARSEF has cultivated collaborations with more than 80 nations and enjoys close relationships with scientists from Brazil, Denmark, Colombia, South Africa, South Korea, China, and Russia. On a recent visit to ARSEF, collaborators from Russia brought along a book. "I immediately asked them if I could copy it," says Humber. Within those pages were descriptions and diagrams about fungi from regions not represented in the collection. "Although the text was in Russian, the book had a lot of data on unrepresented areas, such as eastern Siberia and southeastern Russia. It was a great addition to our database." "The visit was a great example of what we do with other collaborators," Humber says. "We pool data to get a complete understanding of the items we access." Supplying collaborators worldwide with isolates of fungi presents unique challenges. "We are always having to think about what the fungi will encounter from the time they leave here until the recipient gets them," says Humber. "We know that we want to speed shipments along if they have to go where the temperature during transit might literally cook the fungi. Also, we don't want anything left out on a shipping dock or runway in a blinding snowstorm, although the fungi can usually tolerate cold better than heat." Special steps are taken. First, regulatory permits are obtained. For shipment, petri plates are doubly sealed with Parafilm, a stretchable wrap that molds to the plate rims. They are then enclosed in zip-type bags, and placed in bubble wrap. All wrapped plates are fitted snugly into boxes with plenty of extra padding to make sure the cultures can withstand routine shocks and bumps during handling and transit. 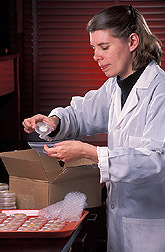 For cultures grown in liquid media in tissue culture flasks, the flask caps are securely tightened and doubly sealed with film. Then the flasks are bagged and padded for shipment. Sometimes liquid cultures are moved into smaller containers to minimize shipment damage to delicate fungi through shaking. Since most ARSEF cultures are in the public domain, corporations have requested and used them in research encompassing agricultural, veterinary, and pharmaceutical applications. In addition, ARSEF absorbs collections from throughout the world that have been abandoned or are threatened for financial or political reasons. The lab has its rare specimens. Among these are the only known collected samples of Neozygites tanajoae, a significant pathogen of cassava green mites in South America. Cassava is a staple crop for poor farmers there—and in Africa—who cannot afford to apply pesticides against the mite. But it is the common fungi that are most valuable. "The reality is that the agents that are most depended on are the lowest common denominators—ones that have the widest host range and are easiest to grow, formulate, and apply," says Humber. Within this group are Beauveria bassiana and Metarhizium anisopliae. B. bassiana is probably the most important fungus in the ARSEF collection. Strains of it have infected nearly every insect pest against which it has been tested. Also, it is the one species most frequently used worldwide in applied, fungus-based, biocontrol programs. The fungus has been requested countless times, and the collection maintains nearly 1,000 accessions of it, sampled from a wide range of hosts and locations. M. anisopliae is the world's second most commonly encountered and second most widely used insect fungus. It, too, affects a huge number and diversity of insect hosts. It is used routinely in Brazil to control spittlebugs on alfalfa or sugarcane, and one variety is now being applied widely in Africa against locusts and grasshoppers. Commercial products based on this fungal species were developed in the United States with ARSEF participation for use against cockroaches and termites. Several labs in the United States and Canada are exploring its use against Formosan subterranean termites. Unfortunately, the ARSEF laboratory that stores such tiny items is running out of space. "We have to make room in the collection, since there is a never-ending need for secure, long-term storage of even more fungi for every conceivable purpose—and even for uses not yet imagined," says Humber. In the meantime, Humber and his staff will have to continue applying innovative techniques to store their precious "jewels" and send them around the world to save crops from pests.—By Luis Pons, Agricultural Research Service Information Staff. This research is part of Crop Protection and Quarantine, an ARS National Program (#304) described on the World Wide Web at www.nps.ars.usda.gov. Richard A. Humber is in the USDA-ARS Plant Protection Research Unit, Tower Rd., Room 340, Ithaca, NY 14853-2901; phone (607) 255-1276, fax (607) 255-1132. "Safekeeping Fungi That Protect Plants Against Pests" was published in the April 2003 issue of Agricultural Research magazine.